Full Moon from our Roof-Top Terrace! This entry was posted in Celebrations, Experiences, Seasons, Taormina, Towns and tagged backpackers, backpackershostel, cheaphostel, cheapjourney, Etna, giannihouse, giardininaxos, internationalhostel, rooftop, Sicily, taormina, terrace on July 2, 2015 by giannihouse. This entry was posted in Experiences, Seasons, Taormina, Towns and tagged backpackershostel, cheaphostel, giannihouse, giardini naxos, hostel, hostelintaormina, international, Sicily, taormina on June 30, 2015 by giannihouse. In Italy, there is no shortage of amazing sites to visit. Just walking down the streets you can feel history calling to you like a siren- frescoes, ruins, duomo, basilica, piazza. It is an embarrassment of riches, really. But my favorite part about traveling in this great country is when you happen upon something that you weren’t looking for. 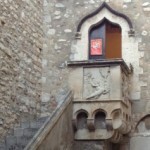 This entry was posted in Taormina on June 5, 2012 by giannihouse.